This is the electronics market prediction for The Netherlands, circa 1966. It was part of a comprehensive assessment by the editors of Electronics magazine of the state of commercial, military, and consumer electronics at the end of 1965. Philips, headquartered in Amsterdam, was singled out as a prime mover for the country. Established in 1891, Philips is still today a major economic contributor for The Netherlands. Electronics' end-of-year issue published its prognostication for Europe as a whole as well as for many individual countries. It also attempted to assess the Soviet Union's (USSR) electronics industry. Philips Gloeilampenfabrieken, N. V., of Eindhoven goes, so goes the Netherlands electronics industry. And for 1966, Philips sees a rise in sales of about 12% over the estimated $2.1 billion worth of business the company did worldwide this year. Even if Philips' forecasts for the coming year - an increase of $252 million - turn out to be somewhat optimistic (hardly likely because of Philips' down-to-earth Dutch way of doing business), 1966 should nevertheless see an upturn in the company's sales curve. After three sparkling years of 12% increases, the sales gain slowed in 1965. The slower gain came as no surprise to Philips' top brass; they had seen it coming. For one thing, 1964 sales of television sets got a strong fillip from the Olympic Games, relayed from Tokyo to Europe by satellites. Also during 1964, Philips delivered some whopping orders for military gear and telecommunications equipment that boosted sales figures. After a year like that, slowdown in sales growth is practically inevitable, even for a high-flying outfit like Philips. But prospects now point to a strong upswing for the coming year. 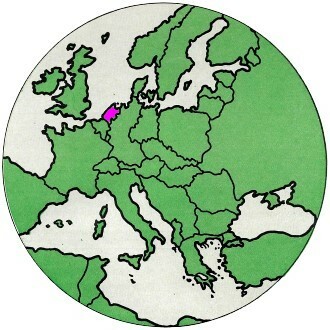 Philips' major market is Western Europe, where the company rings up slightly more than three-fourths of its sales. And for Western Europe, 1966 should be a good year. The Commission of the European Economic Community (EEC), for example, predicts the gross national product for the six Common Market countries will climb nearly 5%, a faster pace of growth than EEC turned in this year. The seven European Free Trade Area (EFTA) countries, led by Great Britain, should do equally well. With that rosy general economic outlook as the background, Dirk D. Otto, manager of Philips' commercial planning department, predicts sales of electronics and electrical consumer goods in Western Europe will increase between 6% and 9%. In his opinion, industrial and military electronics equipment will do even better - 15% or 16% above 1965 sales. A large part of this gain, he expects, will come from computers. Like all European set makers, Philips will be scrambling for tv sales in a market that is becoming tougher to crack. Long gone are the days of the late 1950's and early '60's when consumers snapped up just about everything set makers could turn out. With 55 million sets in use at the end of 1965, the Western European market is between 50% and 55% saturated; the degree varies from 20% saturation in Spain to 80 to 90% in Britain. Even so, Philips marketing men see a 5% yearly growth through 1970, which will boost the number of sets in use to 70 million and the over-all saturation to 73%. At the same time, the ratio of initial sales to replacement sales will just about flip-flop completely. Now, the ratio is 70% initial sales, 30% replacement sales; over the next five years it will swing to 66% replacement and 34% initial sales. That means a market much more sensitive to consumer whim. The whim, of course, could well be changed to serious buying when color tv comes to Europe. But that advent seems at least three years off because of the hassle over which color-tv system the government-run networks of Europe should adopt as their standard. There was a standoff at this year's CCIR meeting at Vienna. CCIR is the International Radio Consultants Committee of the International Telecommunications Union, which represents countries on both sides of the Iron Curtain. The general feeling in the electronics industry is that Europe will wind up with two incompatible color systems - Secam in France and the Eastern European countries, and the West German PAL - an offshoot of the American NTSC system - elsewhere. Great Britain's recent swing to PAL has just about killed the chance for NTSC. Even so, Philips is continuing the experimental broadcasts in NTSC color it started last year. 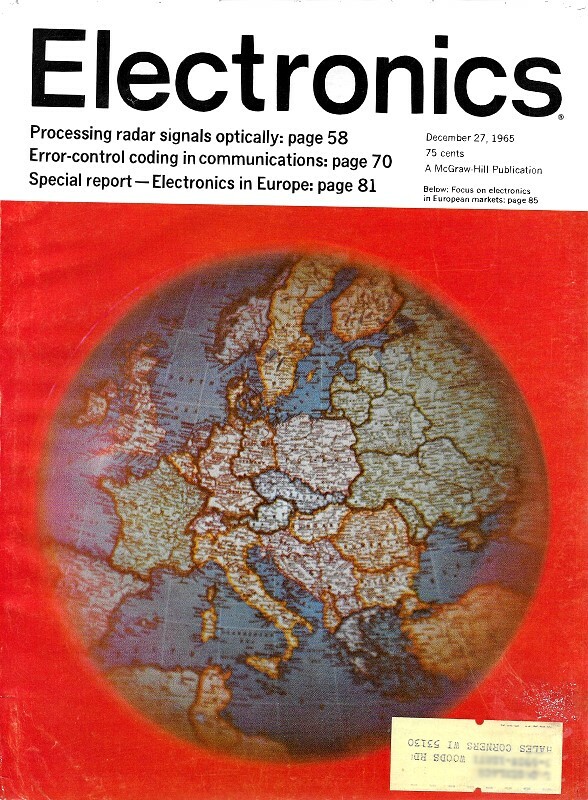 Philips' reading on the introduction of color tv in Europe now looks like this: 1967 or 1968 for Great Britain, West Germany and Italy; 1968 or 1969 for France, the Netherlands, Spain, Sweden and Switzerland; 1969-1970 for Austria, Belgium, Denmark and Finland. Until then, Philips - like other European set makers - can count only on a slowly growing black-and-white market while wistfully watching the color boom in the United States. There's some small comfort, though, in a second-set market starting to shape up now. To tap that market, Philips introduced late this year a fully transistorized set with a 14-inch screen and a vacuum-tube set with an 11-inch screen. For the other major segment of the consumer electronics market - radios - sales for 1966 are expected to rise by 5% over this year's figure of 17.5 million sets, 13 million of them portables. To stem the Japanese invasion of the market, Philips will go to market with sets produced on automated lines, priced in the $17 to $26 range. With these, Philips says it can "fully compete with Japanese competition." For the consumer goods that account for two-thirds of its total sales, Philips sees the wholesale introduction of microcircuits as "several years off." Still, 1966 will see the company's first move into the consumer market with microcircuits. The product: a hearing aid with a linear circuit. Although Philips expects that computers will be a prime factor in the gain of 15% or 16% in sight for industrial and military equipment in 1966, its computer division won't be in the market in the usual sense of the term. True, the division now has under way design of a whole family of process-control computers based on integrated circuits, and Philips is well along in an effort to "computerize" a radio-set producing plant. But for the moment, the company sees itself as its own best customer for its recently formed computer division, which along with the basic computer hardware, turns out tape punch and memory units. In the business computer field, Philips is getting its feet wet through a 40% holding in Electrologica, a small company based in The Hague. Despite its size, Electrologica has cornered a small part of the market in the face of competition from giants like the International Business Machines Corp. and Bull-General Electric, which is jointly owned by the Compagnie des Machines Bull of France and the General Electric Co. of the United States. The vagaries of the military market don't have too much impact on Philips since military sales add up to only about 5% of total sales. N.V. Hollandse Signaalapparaten, the subsidiary that ranks as the sole important Dutch producer of fire-control equipment, won't see its sales boom in 1966 but there's no slump in sight: the company has a substantial backlog of orders from NATO countries, South American countries, Sweden and Switzerland. Signaalapparaten will also deliver next year the phase 2 equipment for the air-traffic control system at the Amsterdam Airport plus a "free route" control system that will oversee traffic for the West German Air Force in the northern part of the country.